Management reports that low wages may be one factor influencing custodial staff shortages, as half the current employees work an additional job to compensate. The beginning of the semester was marked by a staff shortage in custodial management services, reported Carol Kobylanski, executive manager of custodial services. Kobylanski cited several unpredictable issues that came up in late summer as reasons for beginning the year understaffed. The issues included medical issues for employees and some resignations that resulted in filling a couple position openings, said Kobylanski. Additional causes of the shortages are “current staff departures, weekend work schedules and compensation,” said Lucinda Alderman, supervisor of custodial services. However, according Alderman, third-shift custodial has been understaffed since approximately 2008. They used temporary staff for a short time to help get through winter months. Alderman did not respond by press time to requests for the number of years temporary staff needed to be used. Alderman said the low wage is a factor influencing custodial staff shortage. “Public schools are paying anywhere from $12-19 an hour, which makes it hard to compete when recruiting help,” she said. “There are other places that pay more than we do, and when we mention our starting wages, some candidates decline the interview,” said Kobylanski. 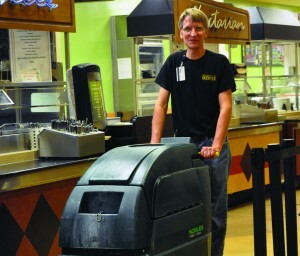 The low wage also leads custodial staff to pursue additional jobs. “A fact that most people don’t know is that at least half of the Custodial department works an additional job to compensate for the lower wage currently made,” said Alderman. However, Kobylanski noted that there are other places that pay less and claimed that job candidates have been excited to get steady hours, pay and benefits. Staff shortage has caused difficulties in completing mandatory tasks. According to Alderman, during the start of the semester, custodial staff was unable to provide some daily floor maintenance. Furthermore, Alderman noted that the shortage necessitated assigning custodians to additional areas/buildings on a nightly basis. “Detailed work has also suffered as a result,” she said. All staff positions in custodial are now filled. “I’m pleased to say that our last open position will be starting soon and one of the medical issues has been resolved so we are getting caught back up!” said Kobylanski. Custodial Services are looking at avenues through which the College campus can provide their own services. “The College campus as a whole can improve with the daily office cleaning schedules by providing their own services instead of relying solely on Custodial Services,” said Alderman. One change being implemented this year will strive to hire students alongside some of the full time staff. “We still have a few openings if students are looking for work,” said Kobylanski. Furthermore, custodial staff will also be working closely with Resident Life to come up with other assignment strategies. “But then again, all of this takes time to put into place … as you know, some in Res Life have just joined the campus as well,” said Kobylanski. When a co-worker is unwell or has had a death in the family, members of custodial staff step up to help where they are needed. “They are an awesome group of people, and it’s because they care about the service we provide to the students that they make it all happen,” said Kobylanski. “Custodial Services provides a safe and clean environment for everyone who uses the campus buildings/facilities and should be respected/valued for the importance of all the lives that are impacted as a result,” said Alderman.